How do i connect Do Gooder with NationBuilder? When you connect your Do Gooder Campaign to NationBuilder your supporters are automatically added (or additional information is added if they are already there) to your Nation. Actions performed on Do Gooder's site OR actions embedded in a Nation (see instructions for embedding an action) will update your Nation's database. Set up your new campaign on Do Gooder as normal (or click the edit icon from the Campaign Overview page to edit the campaign). NOTE: you must first create your Campaign, save it, then return to editing it before you can connect to your Nation. 2) In the Campaign Edit page scroll down to the Advanced Tab and click the + link to open the tab. 3) Scroll down to the "Connect to NationBuilder widget" and enter your Nation's name. 4) Click the Connect to NationBuilder button. If you are not already logged into NationBuilder: You will now see the NationBuilder login window. Log in and you will be redirected back to Do Gooder with a notification that the connection was successful. Sometimes you may not be returned to Do Gooder after a successful log in at NationBuilder. If this happens just navigate back to Do Gooder using then back button and the link will be established. If you are already logged into NationBuilder: you will be automatically connected to NationBuilder. If there are issues please try again and make sure you are logged into NationBuilder. If problems persist contact us! 5. Decide how you want to handle subscription/consent to contact settings within your Nation next. 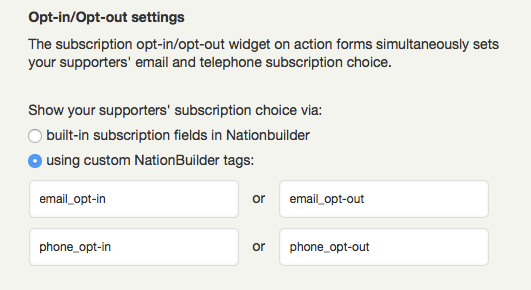 You have the flexibility of using NationBuilder's built-in subscription or custom tags if you also collect seperate consent for contacting via voice or sms. 6. Click Save on the Do Gooder Campaign Edit screen. NOTE: You can also insert tags for each supporter action taken. This is a great way to ensure you know which campaigns and actions a supporter participated in. You do this in the Advanced Tab of the Action itself.